Father-son program declares itself a sovereign nation, replaces campouts and pinewood derbies with blackjack and showgirls. Members of the Pechanga Nation Indian Guides program declared themselves a sovereign nation today and promptly opened a resort casino inside a Newport Beach YMCA. In addition to slot machines and poker, the casino features a Michelin-rated s'mores restaurant and Indian Princess showgirls. Reaction was surprisingly positive. Despite the Newport Beach tribe's overwhelmingly white membership, Native American groups praised the new casino. "Finally, there's an Indian Guides program that doesn't stereotype Native American culture," said one scholar. 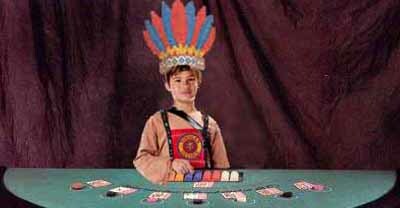 "They've dumped the offensive references to smoke signals, arrowheads and communing with nature  and replaced them with authentic Native American rituals like roulette, golf and Kenny Rogers concerts."